Every film deserves an audience! 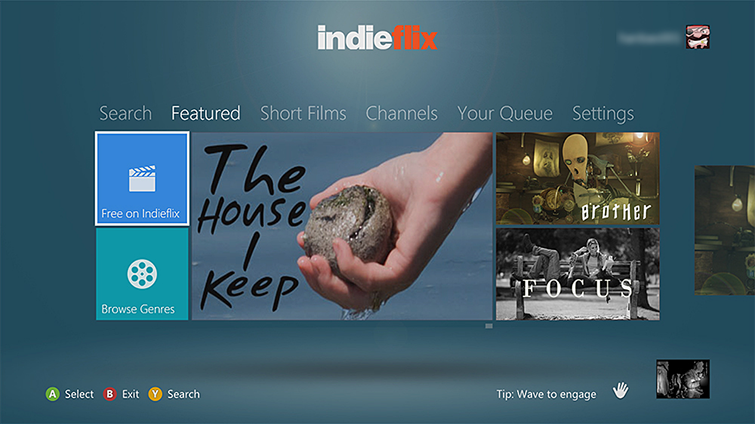 IndieFlix app users can watch award-winning independent movies, shorts, documentaries, and more from around the world. Discover films that launch careers and blaze new trails or that actors and directors make for the love of the craft. An IndieFlix account is required to watch films on IndieFlix. You can watch trailers and browse the IndieFlix content library without signing in to your account. But to watch a film, you'll need to set up an IndieFlix account and associate it with your Xbox 360 console. Browse for the IndieFlix app. Select IndieFlix to download and install the app. 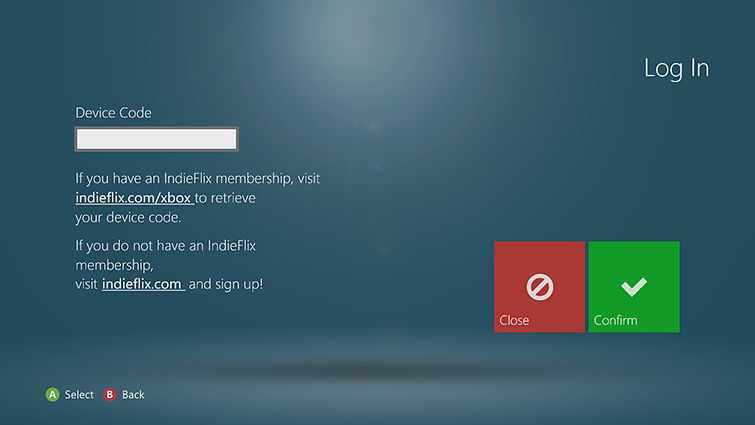 To watch a film using the IndieFlix app, you'll need to sign in to your IndieFlix account. You can sign in from the Featured, Your Queue, and Settings hubs on the Xbox Dashboard. For instructions on how to sign in, see the "Associate your console to your IndieFlix account" section below. To start the IndieFlix app later, go to Video, My Video Apps and then IndieFlix. Go to Video, My Video Apps, and then select IndieFlix. The Featured hub is displayed. When you select content, follow the prompts that direct you to go to IndieFlix on Xbox to associate your console and Xbox Live gamertag with your IndieFlix account. After you've activated the IndieFlix app, you won't be prompted again. Watch any of the content displayed in the centre of the hub. Access Free on IndieFlix to view content without a subscription. Access Browse Genres to search for subscription content that might interest you. Short Films – The content featured on this hub is shorter (in viewing time) than typical full-length films or documentaries. Channels – The content featured on this hub is sorted by genre. Your Queue – This hub displays content that you've added to your queue for later viewing, and also content that you've recently watched. 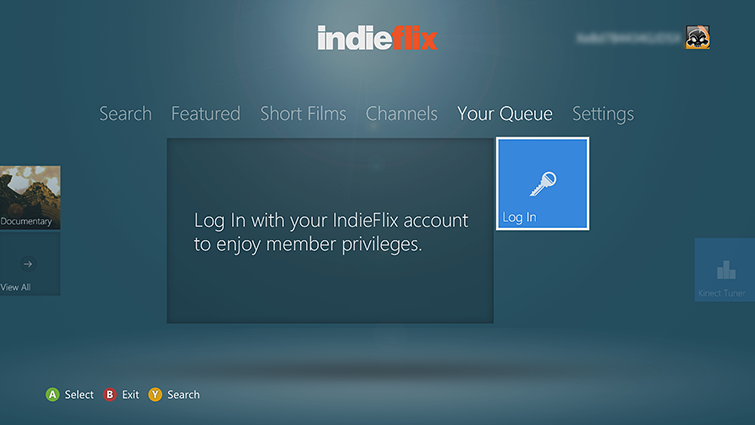 Note Until you activate your IndieFlix app, this hub will display a login screen. After you have activate the app, the login screen won't appear again. Search – Use your Xbox controller to search for and select content for viewing. On the Featured, Your Queue, or Setting hubs, select the Log In tile. Select a piece of content for viewing. Because you need an IndieFlix account to view IndieFlix content, the Log In screen appears, and you are required to sign in. On your trusted PC or other Internet-enabled device, go to indieflix.com/xbox and sign in using your Facebook or IndieFlix account credentials or create a new IndieFlix account. After you've signed in or created your new account, an activation code will be displayed. At the Log In screen, in the Device Code box in the top left-hand corner, enter the activation code displayed on your trusted PC or other Internet-enabled device and select Confirm. A "Congratulations! Association successful" message appears. 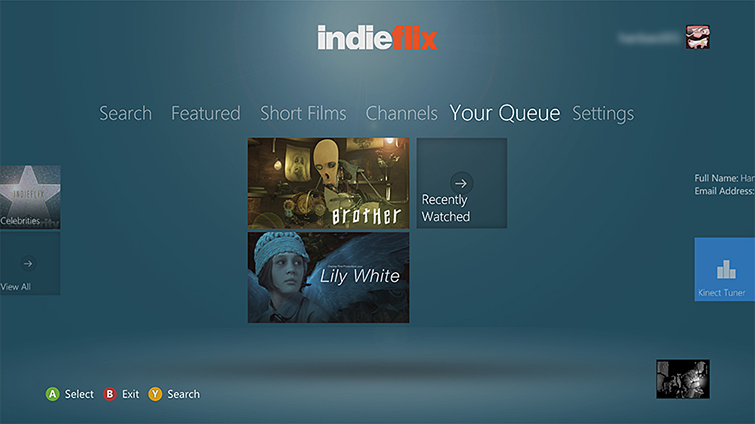 For problems with your IndieFlix account or with content on IndieFlix, email xbox@indieflix.com. If you use Family Settings to control what you share through Xbox Live, the IndieFlix app will follow those settings. For example, if you use parental controls to restrict some kinds of TV programs, those programs will be marked with a “restricted” icon in the IndieFlix app. To play a restricted item, an adult must enter the Family Settings pass code. Would you like to contact Support regarding the "Set up the IndieFlix app on Xbox 360" issue you were reading about or a different issue?